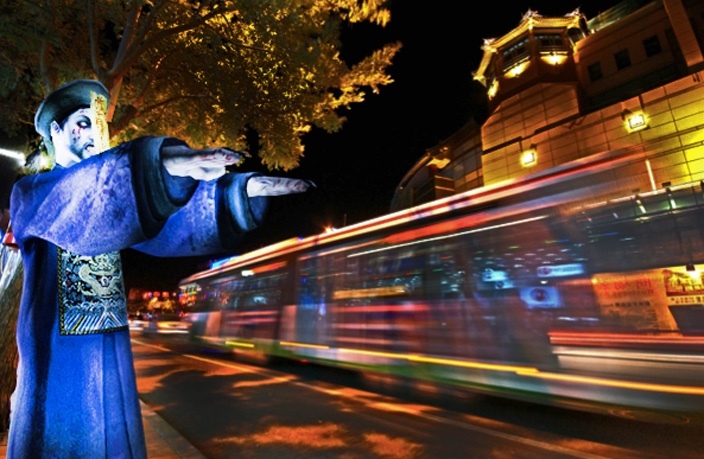 This month’s tale from the Chinese crypt is a relatively well-known Beijing ghost story, a story often called ‘the last bus to Fragrant Hills.’ There are many variations of this story, but we have chosen to stick with the most common incarnation. On November 14, 1995, a dark night and possibly stormy night, a young man boarded the last bus heading to Beijing’s Fragrant Hills, located in Haidian District. Shortly after the man boarded the route 302 bus, two men tried to wave the bus down. According to 2013 Global Times’ article written by Wang Yu, a college student from Haidian District at the time, the bus driver was initially reluctant to pick the men up because they weren’t waiting at a bus stop (pretty sound logic if you ask us), however the driver decided to stop after the conductor reminded him that it was the last bus. Once the mysterious roadside men were on board, passengers were surprised to see they were wearing some pretty badass Qing Dynasty (1644-1911) robes and that there were actually three men – one, with long messy hair, being supported by the two roadside creepers. As the story goes, the men’s faces were much whiter than a normal person’s and they didn’t interact with any of the passengers on the bus. Naturally, commuters were a bit uneasy with the whole situation, but the conductor cooled things over by telling them they were likely actors who had no time to change costumes before leaving work (we can all sympathize with that one). Slowly the bus began to empty of passengers, until only an old lady and the young man remained inside with the mystery men. All was quiet until the old woman abruptly accused the man of stealing her wallet – a claim that resulted in an intense argument. The quarrel was resolved when the old lady insisted the pair get off the bus and go to the nearest police station. Once off the bus, the young man grew enraged with the old woman, realizing he had just got off the last bus and that there was no police station in sight, according to the Global Times' story. Fortunately for the young man, the elderly woman picked up on something he had missed – the three robed men did not have legs and, by default, must have been ghosts. "The wind coming in from the window raised their robes, and I saw they didn't have feet!" the old lady told the man. The story never does divulge much about what happened to the pair after leaving the bus – but if what happens next is true, then the young man owes his life to the old women. The following morning the 302 bus was reported missing and, according to some variations of the story, it would be three days until it was found. The bus was eventually recovered in a reservoir miles away from its final destination at Fragrant Hills and inside it were three heavily decomposed bodies – the driver, the conductor and one unidentified body with lengthy, unkempt hair. In some versions of this tale, police found that the gas tank was filled with blood instead of petrol. According to Atrocitas, an online paranormal and horror blog, there are a number of mysteries that surround this case, including the fact the bus didn't have enough petrol to get to the reservoir and that the bodies were too heavily decomposed for the relatively short time they were missing. The blog also claims that police officers scoured the security footage retrieved from cameras around the reservoir and found nothing out of the ordinary. Alternate versions of this story substitute the three phantom men for a murderous female ghost in a red dress. The bus numbers vary greatly – commonly cited routes are 302, 330 and 375. In some versions it is an old man that accuses the young man of stealing his wallet. Some variations of this story claim the bus was never located. The best tracks from artists playing in Beijing in March - all in one handy Spotify playlist. A cornucopia of literature, writers and illuminating discussion, the Bookworm Literary Festival runs from March 8 to March 25. With fewer women in the dating pool to choose from, some men are making their own. Tales of the City: Beijing's new smoking ban, will it work? We hit the streets to see what residents thought of Beijing's upcoming smoking ban.